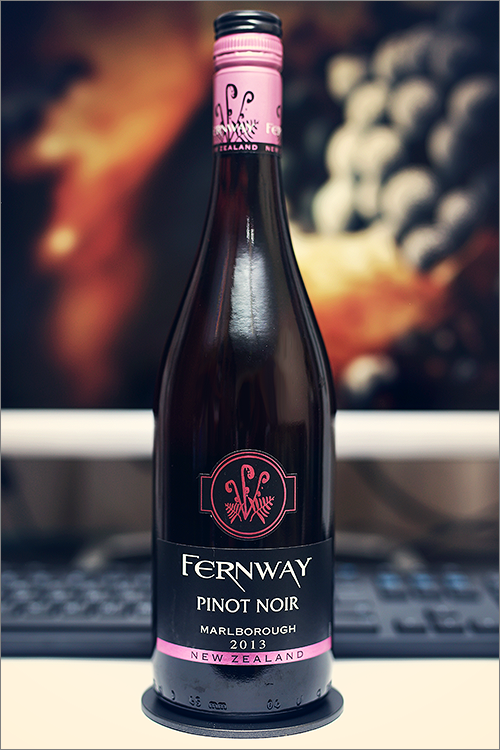 Tonight we are going to review a New Zealand wine – Pinot Noir Marlborough 2013 from Fernway. New Zealand has long claimed to make the best pinot noir wines outside Burgundy and certainly there are many fine examples in the Marlborough region. Pinot noir is rightly considered the most difficult grape to grow, and as a result, the most difficult wine to make. What makes pinot noir wines special, is the fact that it can conserve the terroir of the region in a way no other grape variety can, but enough theory, let’s move on with the tasting and find out just how good this wine is. Clear and transparent bright ruby color, with hints of copper towards the rim of the glass. The nose is rich, filled mostly with savory flavours and red fruits: dried cherry tomato, red currant, raw veal meat, wolfberry, rose hips, pomegranate, cranberry and dried cherry. An instant later the nose is filled with delicate notes of forest floor and some subtle hints of truffles. The wine is dry, with high alcohol level, high acidity and smooth tannin. It tastes light, savory and lean, with a quite nuanced fruity accent . This is a silky, meallow and crisp pinot noir wine, with a quite elegant body. The wine has a fair overall balance and a nice harmony between all its elements. It has a medium finish and an balanced, crisp and smooth aftertaste. This is definitely a great Wine of New Zealand and the overall rating says the same, with 90.1 points scored it is right there, among the best wines we’ve tasted so far. Please click on the chart icon on the left in order to get to the wine rating page, where you can find all the wines we’ve tasted to date. Conclusion: this is a wine in its prime form, one that can age for another 6 or 12 months, and yes, this is a typical pinot noir wine, very well made, with the right balance between savory and fruity notes. We would highly recommend this wine as an introductory course in the vast world of pinot noir, specially for getting to know more about new world pinot noir. For a better wine experience, pair this wine with meat dishes that are rich in savory and irony flavours, like for example a tournedos fillet rossini with foie gras and truffles, as this is a wine-and-food pairing that is impossible to forget. Enjoy!